The Combat Paper Project came to the University for this past weekend, from Friday, Sept. 25 to Monday, Sept. 28. The Combat Paper Project came to the University for this past weekend, from Friday, Sept. 25 to Monday, Sept. 28. 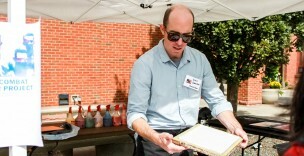 The project, which travels to various venues across the country, encourages members of the veteran and the non-veteran communities to use traditional papermaking techniques to create paper, prints, books, and art by hand out of military uniforms. According to its website, the project, based in San Francisco, is also affiliated with paper mills in New Jersey, New York, and Nevada. So far, the Combat Paper Project has not only traveled throughout the United States, to Canada, various regions of the United Kingdom, and Kosovo. The event opened with an exhibit on Friday, continued with two workshops and a demonstration on Saturday and Sunday, and concluded with a talk by the artist, Drew Cameron, on Monday. According to Cameron, the co-founder of the Combat Paper Project and an Iraq war veteran, this project began in 2007 when he first turned his own uniform into paper. Not only do the papermaking workshops and lectures teach participants a new skill, they also pave the way for a larger discussion about civilians’ and soldiers’ collective understanding of war. The University’s event page for the Combat Paper Project included an excerpt of Cameron’s writing, where he further explains the rationale behind the workshops and project. Following the workshops, the finished products were displayed in Usdan featuring a range of prints on made from old military clothing, centered on the theme of combat. Cameron describes the project as a method of sharing experiences and stories. To this end, the Combat Paper Project also conducts workshops to teach papermaking as a form of art therapy. Another point of inspiration for this project is Cameron’s passion for crafting paper. During the interactive workshops that were held for the public, Cameron helped everyone in attendance create and decorate their own pieces of paper. Participants had many options to personalize their projects with a variety of stencils. Library Assistant of Scores and Recordings, the World Music Archives, and Special Collections and Archives Jennifer Hadley saw this as a great community event. Cameron views the project as a connection between the arts and the military. The project has been receiving positive feedback from students. Andrew Olivieri ’18, a member of the Posse foundation, found the event especially meaningful from the perspective of a veteran. Arielle Schwartz ’19 attended and participated in one of the interactive workshops.